New Year, New You? Don't Forget Your Skin! January is a great time for new beginnings, new years resolutions, and new products! Winter is a dry time for everyones skin. If you don't already know, I have had eczema my whole life. I am definitely most self conscious about my skin. I get really red, splotchy, and itchy on my arms, neck, eyelids, lips, and face. I have tried every skin product in the book and nothing really seems to work. 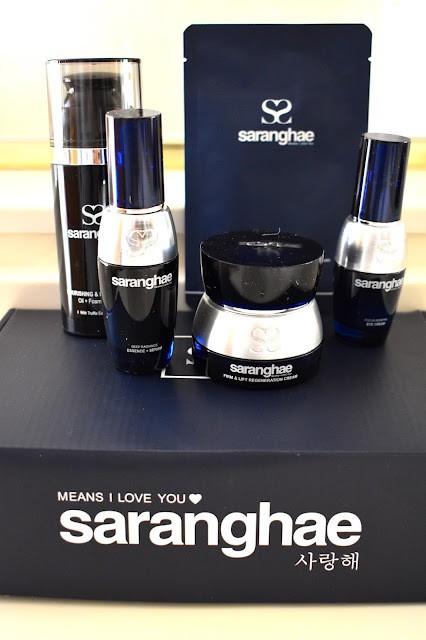 That's why when Saranghae reached out to me to try out their new line of products, I was excited to give it a try! Read my full product review right here! I have tried a lot of different products in my day, and this product is awesome! I was slightly hesitant to how much I would like this product because it is designated for anti-aging. I am 21 years old, and aging is not my most pressing concern in my life. Even though I was hesitant, I decided to give this product a go! To my surprise, I actually really loved this product! I love how light it feels on your skin. These products are great because they help to moisturize and hydrate the skin while it cleans and softens. This product is a simple 5 step routine, that gives step by step instructions, as well as provides video demonstrations and tutorials to show you exactly how to use it. The cleanser and the moisturizer are my favorite products in the set. The cleaners gets a really deep clean, effortlessly lifting oil, makeup, and everything else! It even got way down and dug out all the gunk from my jawline zits I’ve always suffered from. I actually liked the firm and lift creme, which is the priciest out of the lot. It felt really luxurious without being too heavy. It settled into my skin really well and I woke up with super smooth super soft skin, not a dry patch in sight. Because of my eczema, I need a product that is going to work all the time. After a week of using this product, I am very happy with the results and the smoothness on my eyes. All in all, I have enjoyed using this product! If you don't currently have a skin regimen you love, I would highly recommend giving Saranghae products a go! If you like the products you have, I would stay where you are at! My favorite pieces were the cleanser and the moisturizer, and you can buy a bundle with just those products as well! Taking care of your skin is SO IMPORTANT! My advice to you is to always take care of your skin!!!! !